Welcome to our custom swimming pool design ideas where we feature many terrific pool designs including in-ground, custom shape, covered, indoor, infinity and many more for your ultimate backyard inspiration. 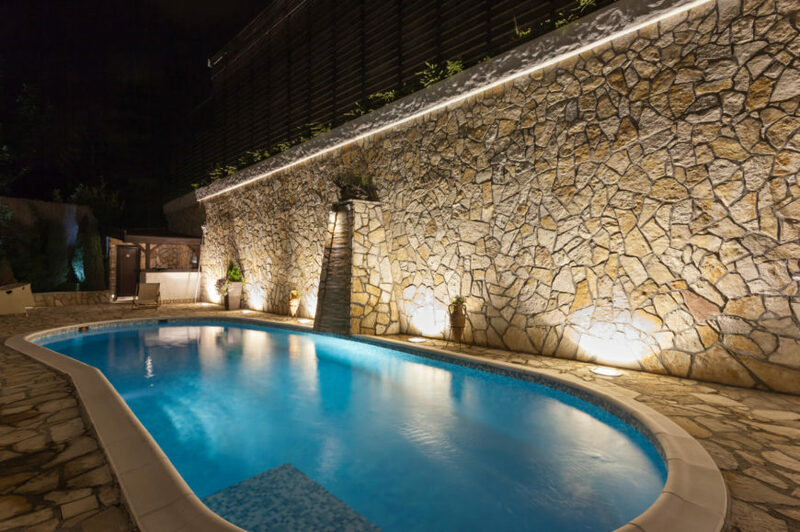 This is our main custom swimming pools gallery where you can browse hundreds of different swimming pool designs by a variety of builders. 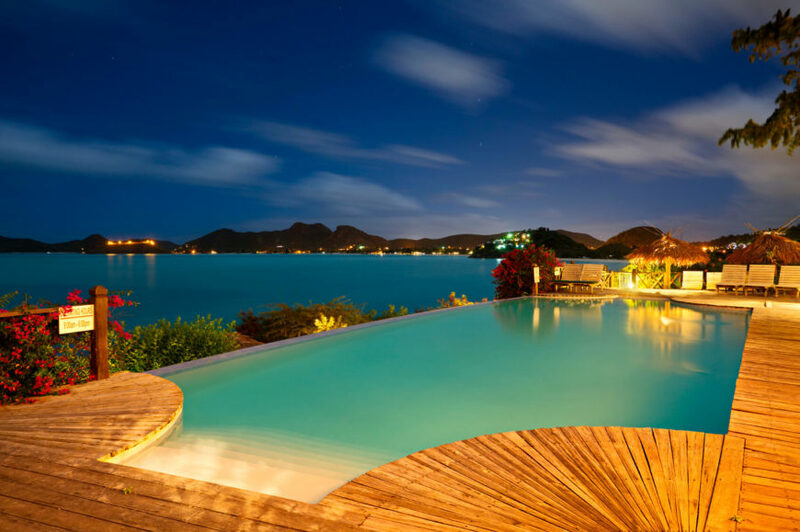 Read our extensive “11 types of swimming pools” below the gallery. D. How Much Does it Cost to Build a Pool? E. Size: How many gallons of water are in a swimming pool? Residential inground swimming pool in backyard with waterfall and pool spa. Here’s a neat example of a small pool in a small suburban backyard. The entire backyard is pool and pool patio. It’s very simple but looks great. I like how the hot tub is embedded in the swimming pool. I also love the two-tone pool patio (white border with light grey patio). Also, notice the corner planters – that’s a great idea any pool owner can incorporate easily. Another example of a great inground pool in a small backyard. In fact, that’s a fairly small pool with embedded attached hot tub. Notice how striking the white tile patio is. Something to keep in mind. Example of a small pool on cliffside property with a massive flagstone patio that takes up the entire backyard. Here’s an island pool. By island pool I refer to a pool patio not fully attached to the patio off the house. The pool and patio is in the middle of the yard. This is a hybrid version since there’s a flagstone walkway leading from the house to the patio, but the effect is the same. Modern pool design in the backyard of a modern home. Notice the light blue color. I particularly like the shape – that angled edge from the narrow part to wider part makes it very interesting. I love the tall tree hedge surrounding this modestly sized backyard. If you want the resort look and feel, this it. Here’s a backyard with a darker water color made to look like a natural river pool. There are palm trees and gardens surrounding it. It’s spectacular. Here’s a desert home in Arizona with a small curvy shaped pool with attached hot tub. It’s hard to tell from this angle, but this is an infinity pool. Yeah, it’s pretty simple how they design that effect. I like the cacti gardens surrounding this pool and the lounging patio with outdoor oven is a nice touch. Great backyard design for a regular sized backyard. Mediterranean style home with a Mediterranean style pool. Check out the blue tile made to look like a cascading waterfall into this beautiful rectangle pool surrounded by colorful gardens. Large treed backyard with rectangle pool surrounded by a fabulous multi-colored patio. This small backyard pool is all about the landscape design. Check out the rock work and waterfall flowing into the pool. It looks just like a pool in a river. Notice the elevated lounging area overlooking the pool as well. This is a stunning backyard. Here’s a small grassed-in backyard with a pool that has no patio around it. Interesting. I definitely prefer pools with a deck or patio, but this is an example of one without. Here’s a huge rectangle pool on a massive property with an absolutely humongous patio area. That is a lot of stonework. Here’s a great example how to create a lush pool area that looks larger than it is in a small space. 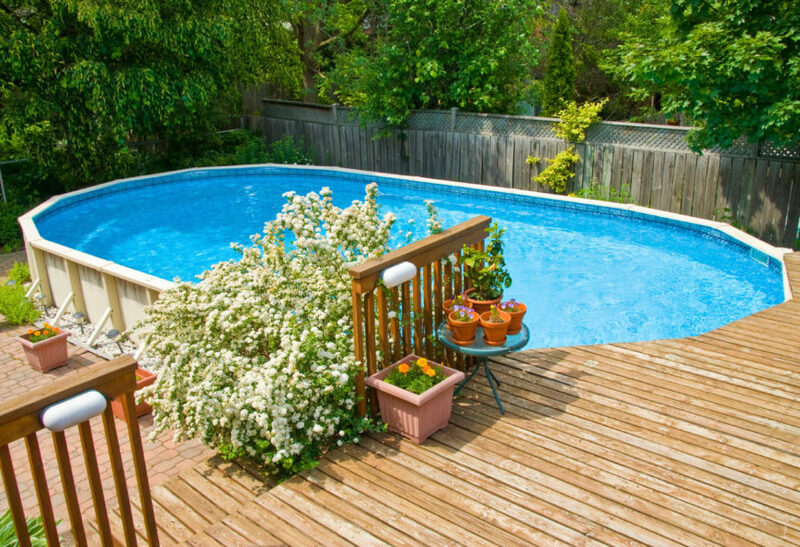 The key here is plants – notice all the vegetation which makes the backyard and pool look larger than it is. Very smart. Now that’s just one big kids’ area in the backyard – large rectangle pool with a slide, basketball hoop surrounded by wrap-around patio which is in turn surrounded by gardens, grass and trees. Here’s an example of how surrounding flowers and bushes can enhance the look of an already beautiful pool. I love the brick patio with off-white pool border. 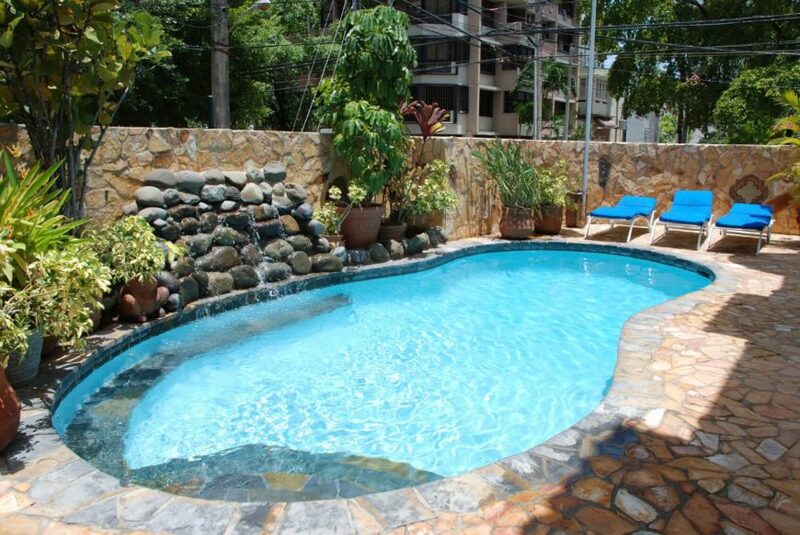 Tropical backyard with zero-entry pool with waterfall in large heavily treed backyard with huge surrounding patio. New desert architecture suburban home with a tiny backyard pool with a lounge ledge. See the shallow area? That’s a lounge edge where you can place lounge furniture. I love that. Notice the unique table in the pool as well. This is purely for cooling off… can’t really do laps. Here’s a side view of an infinity pool that uses the exterior infinity edge as a way to enhance the backyard by making it a fountain waterfall. This is a very clever pool design… something to consider for your pool project. 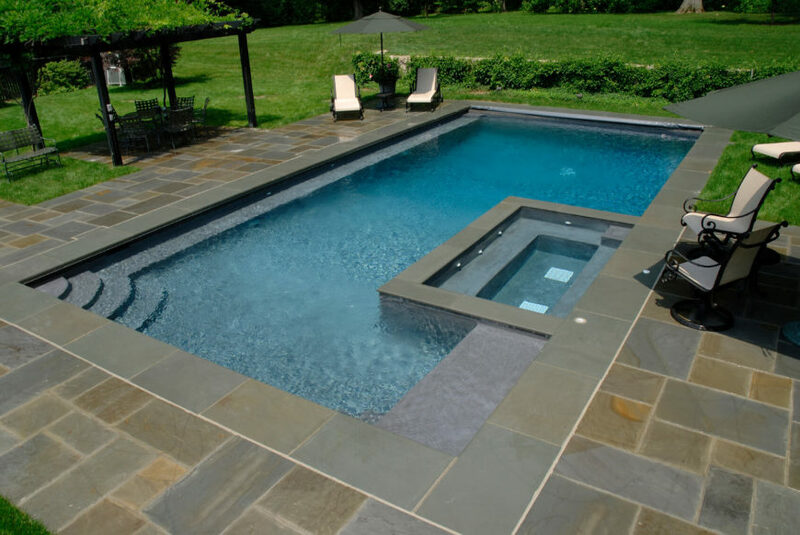 Gorgeous freeform swimming pool with gray stone patio in a lovely backyard. We invite you to pin away and bookmark this page as we’ll be adding more pools all the time. Swimming pools of all kinds allure me like no other home design element. I suspect my love of pools stems back from when I was a kid. It was a Saturday afternoon and my dad was taking care of us 3 kids. We were booting around town with Dad as he did a few errands. One of those errands was to get us signed up for swimming lessons. I was around 5 or 6 years old. It’s one of my earliest memories. We drive up to the recreational center that housed our town’s pool. We walk into the reception area and BAM – there it was through the glass… the large, crystal blue pool. I wanted in. I actually thought we were going swimming. My young mind couldn’t comprehend that my Dad was there to only sign us up for swimming lessons, not to go swimming. I saw the pool and I wanted in. Dad did his best to reason with my young, illogical mind to no avail. I entered tantrum mode and we drove home. I still remember like it was yesterday my glimpse of the pool. It was magical. Ever since then pools have held a magical sway over me. How much space do you need for a swimming pool? Fortunately, not much given you can build a very small pool (i.e. dip pool). That said, you do want to have enough space surrounding the pool. Here’s an illustration setting out sufficient yard dimensions for a swimming pool. Swimming pools are a guilty pleasure. I love looking at the photos and can’t wait to one day to hire a custom pool builder to get a luxury swimming pool put into my backyard. Growing up I was a water nut. Couldn’t get enough of swimming in pools. I’m still a water rat and now that I have young kids I do more swimming than I could ever wish for. Sadly, we don’t have our own backyard pool and so we visit public pools often. Just last weekend we did another 1.5 hours at our local wave pool. Yeah, we’re fortunate to have an amazing public pool with zero-entry and wave sessions. It’s a kid paradise. While we don’t have plans for a backyard pool, I don’t rule it out. The issue is we live in a climate where we can realistically use it three to five months out of the year, which isn’t very much. If we lived in a hot climate, we’d definitely have a pool. Not only do I love swimming and they’re amazing for kids, I think they look fabulous in any yard. They sparkle like a gem among the lawn and gardens. I flat out love the look a pool in any backyard. If you’re more fortunate than me and are actually going to install a swimming pool, the good and bad news is you have many options to consider. That’s what this article is all about… setting out the many different types of backyard pools. There are several pool categories demarcating different types. There’s main types (infinity, zero-entry, etc. ), shape and material used. We set it all out here. By regular I’m referring it’s your standard in-ground pool of average size. 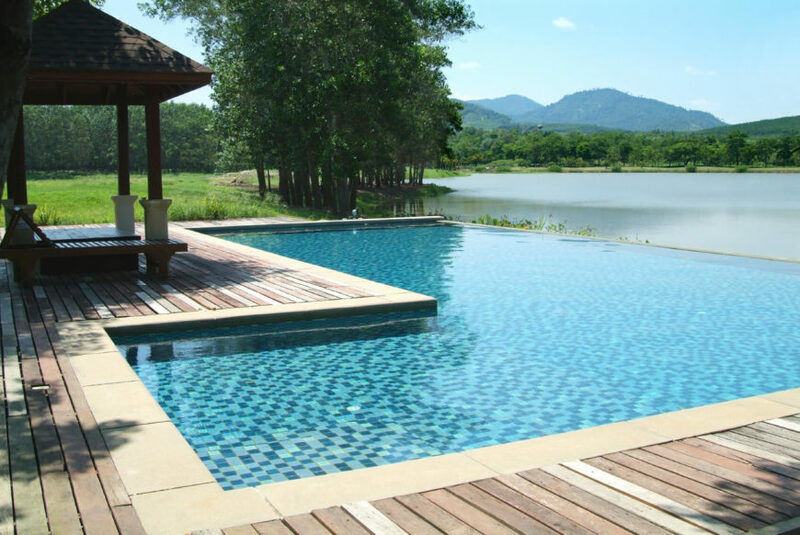 This is the most common although infinity pools are very popular. Infinity pools create the illusion of the edge disappearing over a cliff. It’s a very cool look and extremely popular. 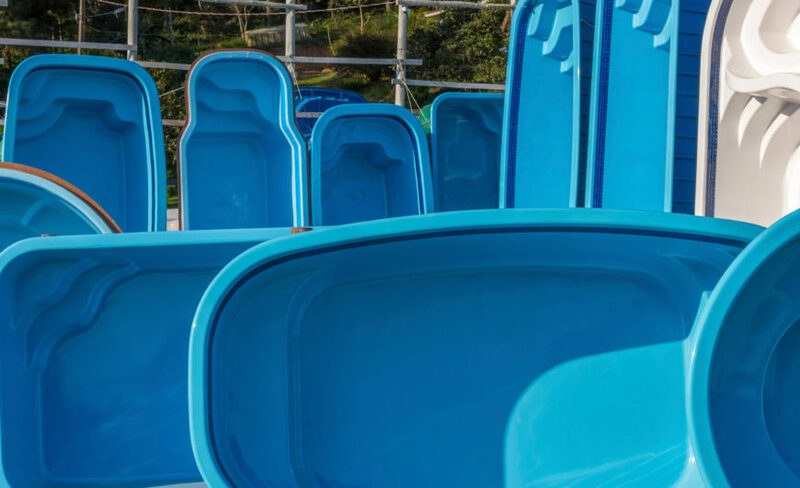 Lap pools are skinny and long in a rectangular shape designed for swimming laps. These aren’t terribly common, but for people who swim primarily for exercise, they’re a good option. You can easily use a lap pool as a regular pool too. This isn’t too common, but it’s a great feature if you have young kids. This type of pool has a lake or beach style gradual entry. These are smaller pools that you can heat up higher than regular pools and use it as a hot tub/relaxing pool. These are smaller pools designed to provide a place to dip in and cool off. Great for small backyards or courtyards. Endless pools is an example where the pool pushes water out against which you swim for exercise. This way you can swim without moving and so you don’t need to flip around constantly. 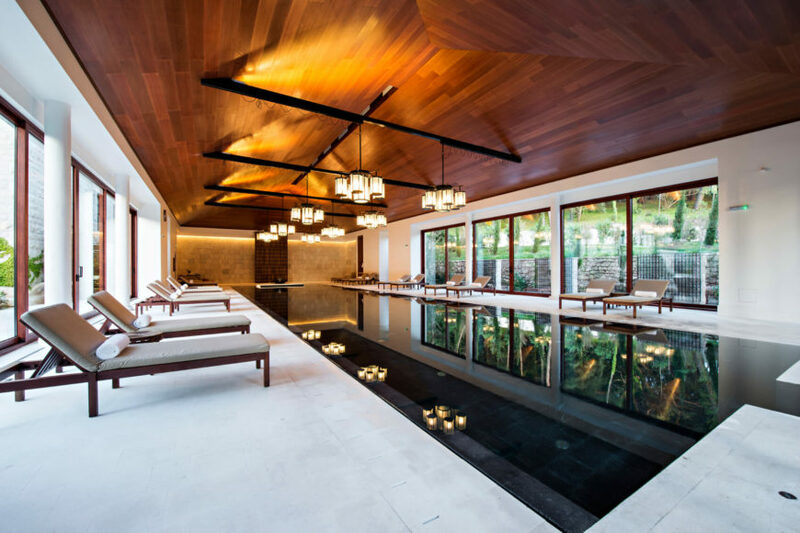 If you live in a colder climate, an indoor pool is a great option. The downside, of course, is it’s not nearly as nice when the weather is warm because who wants to be inside on a warm, sunny day? Not me. 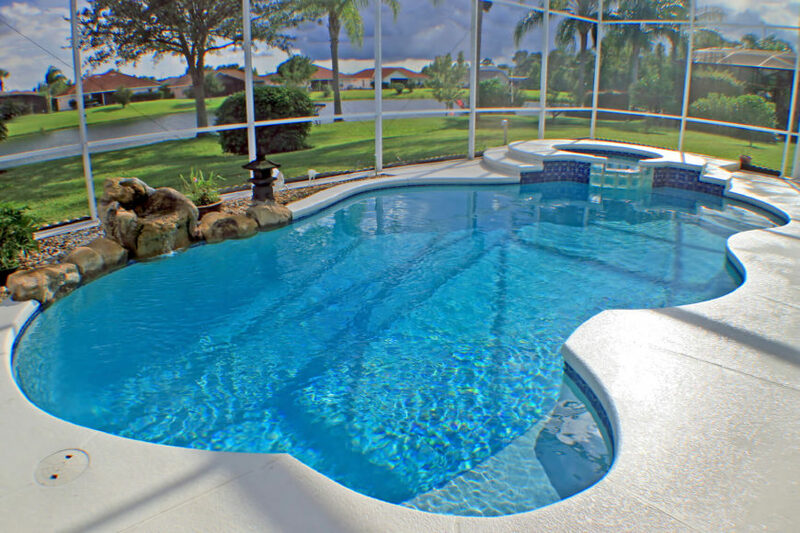 Pools in areas with a lot of bugs or other wildlife that can take over a pool solve the animal problem with a large framed-screen built around the pool. This is very common in Florida. If you don’t like chlorine and other chemicals used to keep water clean, you can opt for a salt-water pool. These are fabulous. If you’re on a tighter budget, you can consider an above-ground pool. With some smart deck design, you can make it appear like an in-ground pool. 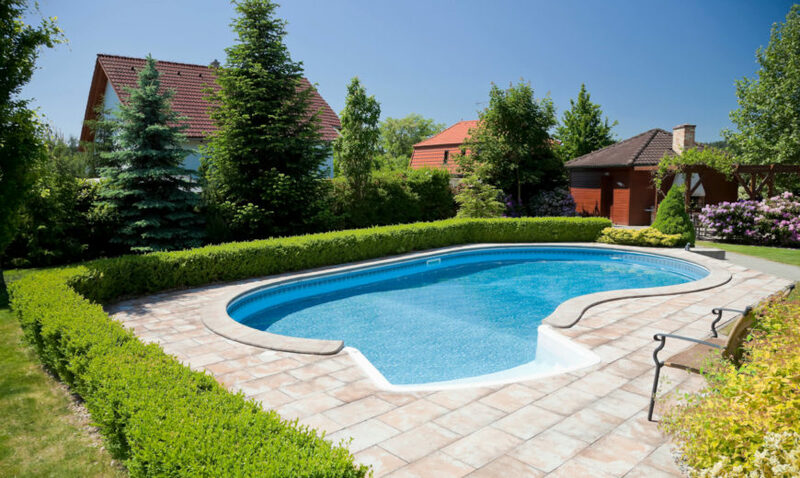 Until recently, concrete was the predominant in-ground pool material. You dig a hole and pour in the cement. While still used, concrete isn’t the only in-ground pool option. Concrete is great for custom shapes. 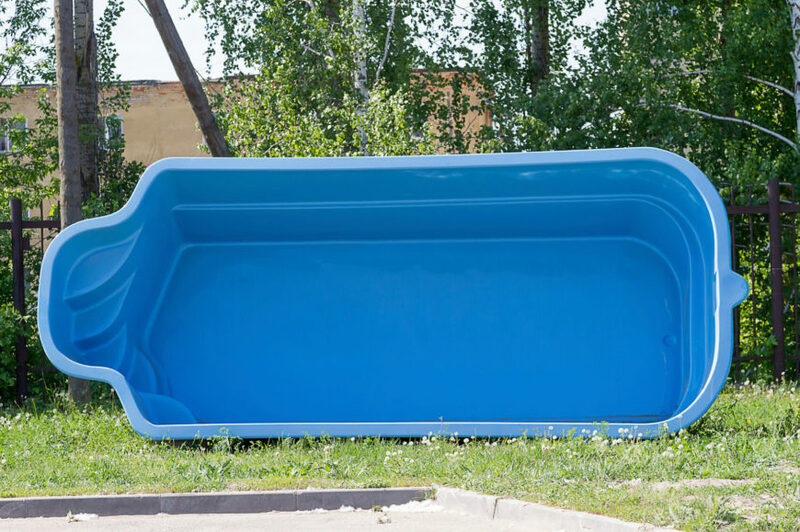 A fiberglass pool is delivered to your property in one piece ready to install. It’s like a large bathtub. The big benefits is it’s fast to install, less maintenance and lasts a long time. The downside is that you are limited to shape. A vinyl-liner pool is one that is a series of panel walls that are assembled on site. It sits on a concrete foundation. Great for custom shapes and is the least expensive in-ground pool option. Also, it won’t crack (durable) and doesn’t require rapainting. A container pool is a pool made out of large containers. You can drop them in a hole or place them on the ground. They are less expensive than concrete or fiberglass and they are very efficient heat-wise. This company builds and installs shipping container pools. 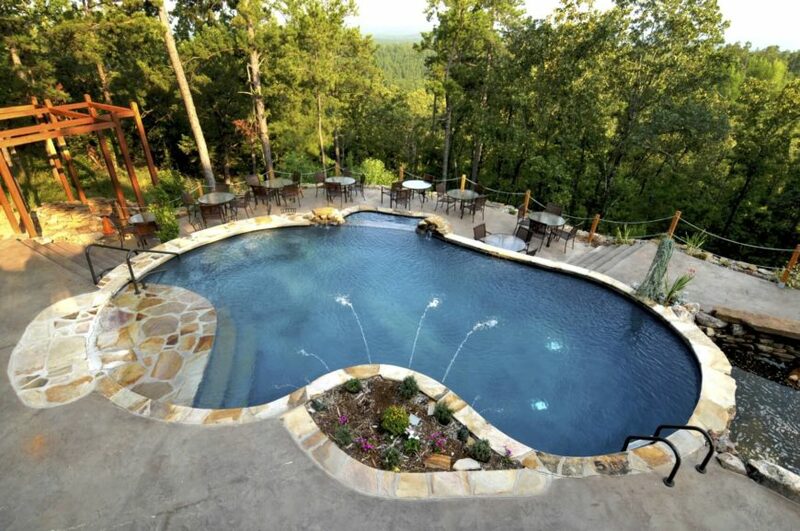 Kidney shaped pools are fairly popular. Length: 5 meters to 12 meters. How many gallons of water are in a swimming pool? Small pool: 2 meters wide x 6 meters long x 1.5 meters deep = 18 cubic meters which equals 4,752 gallons. Mid-size pool: 4 meters wide x 8 meters long x 1.8 meters deep = 57.6 cubic meters which equals 15,206 gallons. Large pool: 6 meters wide x 12 meters long x 1.8 meters deep = 129.6 cubic meters which equals 34,214 gallons. Of course, you can build smaller (plunge pool) or larger pool. Lap pools may only be 1.5 meters wide for instance. Setting out an average size is a bit silly because at the end of the day most pools are custom built and can be any size. However, we include the range just to give you an idea of common sizes. 1. Fencing: This is important and you definitely want to consult a local pro as to fencing requirements. The last thing you want is a child to drown in your pool. The pool fence is critical. 2. Slide/waterslide: Since the old-school slides aren’t terribly safe, they aren’t common. Waterslides are taking their place, but that is not cheap. Building a full-blow waterslide will cost thousands and take up quite a bit of space. The plus side is it’s an amazing feature if you can swing it. 3. Diving board: Like slides, these aren’t as common due to the risk. Again, consult a local pool pro about the legality and viability of a diving board. 4. Hot tub: I think these days most in-ground pools are build with an accompanying hot tub. I think it’s a no-brainer. If you’re going to maintain a pool, you might as well maintain the hot tub. 5. Bar: Not super common in residential backyards, but if you like entertaining, you can add a tiki bar or something like that. If you’re really into adult swimming parties, you can build a swim-up bar like the hotels. Of course, you need a designated bartender. 6. Cave: Another feature kids love. They can also be romantic. You can construct a real or faux rock formation adjacent to the pool and include a pool cave element. 7. Lazy river: If you have space and loads of money, you can construct an entire pool canal or lazy river throughout your property. Yes, some people have done it. 8. Rock structures: A well-designed and constructed rock structure can look amazing next to or wrapping around a pool. I think it looks great. 9. 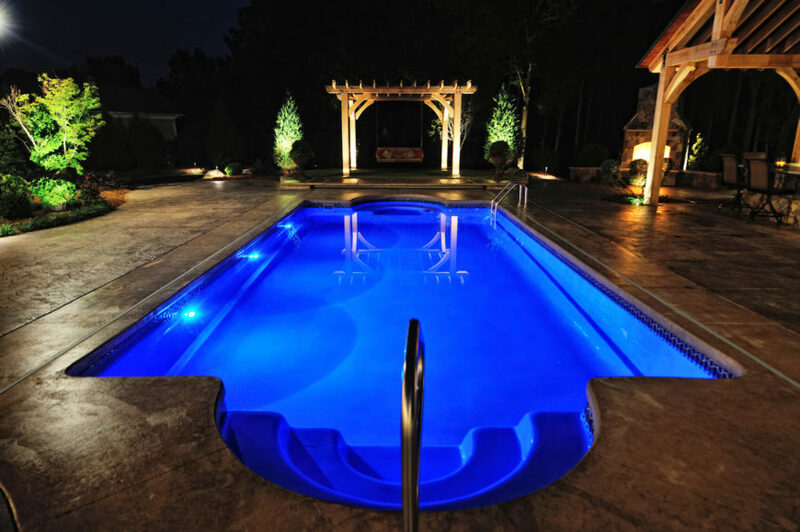 Lighting: Lighting can make a big difference in your pool atmosphere in the evening. You want lights in and outside the pool. 10. Cabana: If you have space an money, why not create a separate structure serving as a cabana which can be an outdoor living room, outdoor kitchen and/or a guest house. 11. Automatic cleaners: If you don’t hire a pool cleaning service and you don’t recaldlish cleaning it yourself, look into automatic pool cleaners. For me, it’s a no-brainer; I prefer in-ground pool. I realize that if I move, the pool ain’t coming. I’m okay with that because I like the larger size and appearance of an in-ground pool. However, an in-ground pool isn’t always an option due to budget constraints. Above-ground pools are much cheaper and if you’re in a hot climate and that’s all you can afford, it’s much better than nothing.